The following was last updated on December 03, 2016. The amount of dead bees that can accumulate on the bottom of a Langstroth hive by December 12th is somewhat alarming. These particular photos are from my largest colony. Most of the other colonies weren’t as thick with corpses. My guess is about two thousand dead bees? Click the photo for a more detailed view. 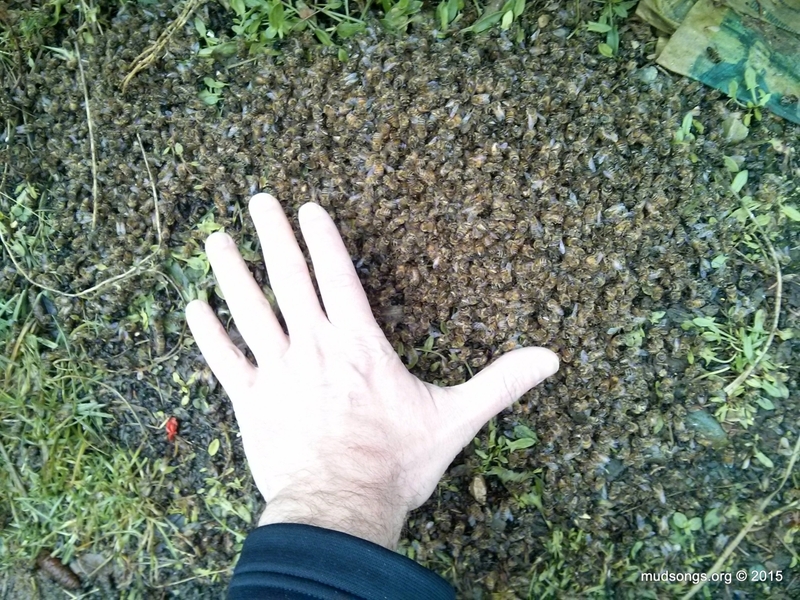 I’ve seen spring clusters smaller than the pile of dead bees I pulled out of this hive. (In fact, this colony, after being nearly destroyed by shrews over the winter, was built up from a sad looking lot of bees barely covering two frames and a patch of brood about the size of a baseball last May. I mention this because I deserve a metal for bringing that colony back to life.) But considering the colony went into winter with possibly 30,000 bees (it’s a big colony), the loss of two or three thousand bees shouldn’t be a catastrophe. 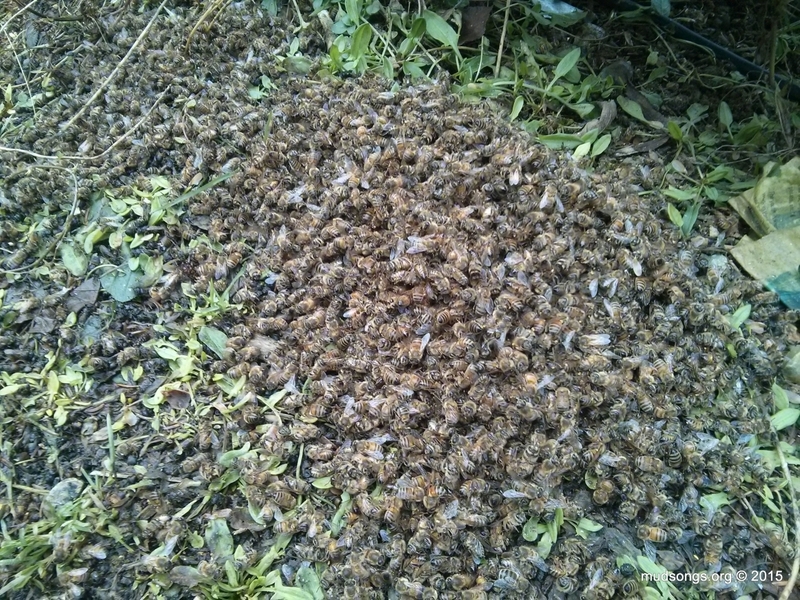 The above photo shows some riled up bees in another hive. I managed to pull the mesh off without disturbing them, but as soon as I stuck the stick in to scrape out the dead bees — the bees came pouring out and a few went for my face. That’s not something I’m normally in love with, but I take it as a good sign. If the bees are defending the hive, it usually means they have something worth protecting — like a queen. I was concerned the quarter-inch / 6mm mesh would prevent the worker bees from cleaning out the dead bees over the winter. It does. I’ll look into a different method of shrew-proofing my hives for next year, but the stapled on mesh isn’t as troublesome as I thought it might be. Removing the mesh, cleaning out the dead bees and stapling the mesh back on wasn’t difficult. The bang of the staple gun didn’t seem to bother the bees too much (I was quick with it and used as few staples as possible). However, I’ll probably go as long as I can before I do it again (I’ll wait until the entrances are blocked with dead bees, if the entrances are ever blocked with bees again this winter), and I’ll only do it on warm days. It was about 5°C today, whatever that is the old Fahrenheit scale, a few degrees above freezing and no wind. DECEMBER 15, 2015: I’ve since switched to using thumb tacks instead of staples to secure the mesh to my hives. Removing the mesh, cleaning out the dead bees and reattaching the mesh is quick and easy now, with little or no disturbance to the bees. DECEMBER 03, 2016: I’ve barely found any dead bees on the bottom boards of any of my hives so far this year. I’m not sure why that is. I have colonies this year that are easily as large, if not larger, than my largest colony from last year. The only difference I can think of is the weather. This November was much warmer than last November. 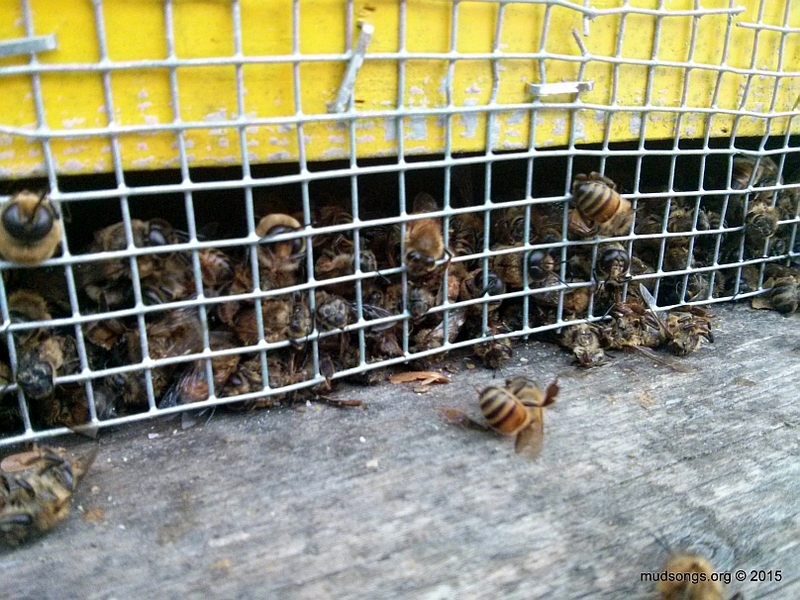 The bees in most of my colonies last year, when it was colder, were clustered well below the top bars and there were more dead bees on the bottom boards. 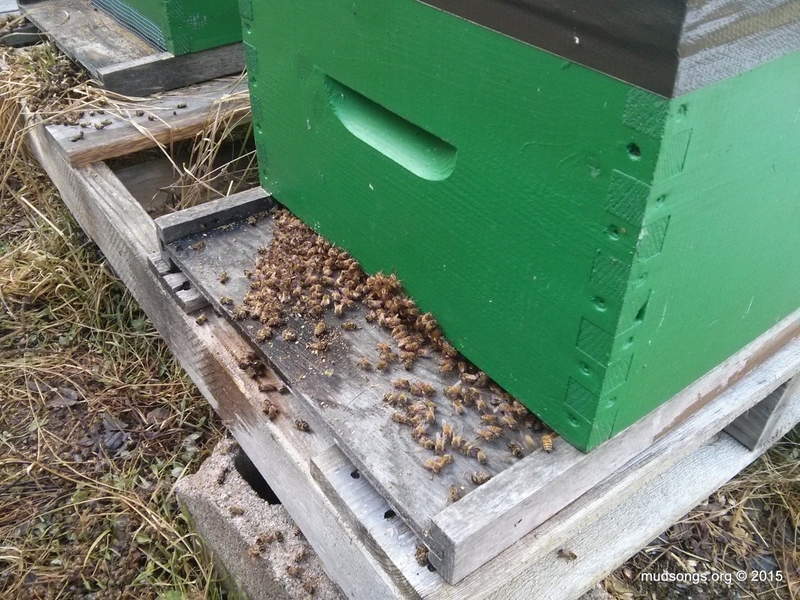 This year, with warmer temperatures, the bees in most of the hives are clustered close to or above the top bars, not down below where they usually go, and there are hardly any dead bees on the bottom boards. Perhaps the warmer weather has the bees eating more honey, staying warmer and not dying off as quickly in the cold. Perhaps just as many bees are dying up top, but they’re getting clogged between the frames in the bottom deeps. I don’t know. This entry was posted in Dead Bees, Diseases & Pests, Mesh, Month of December, Shrews. Bookmark the permalink. Would it be possible to secure it with drawing pins rather than staples? 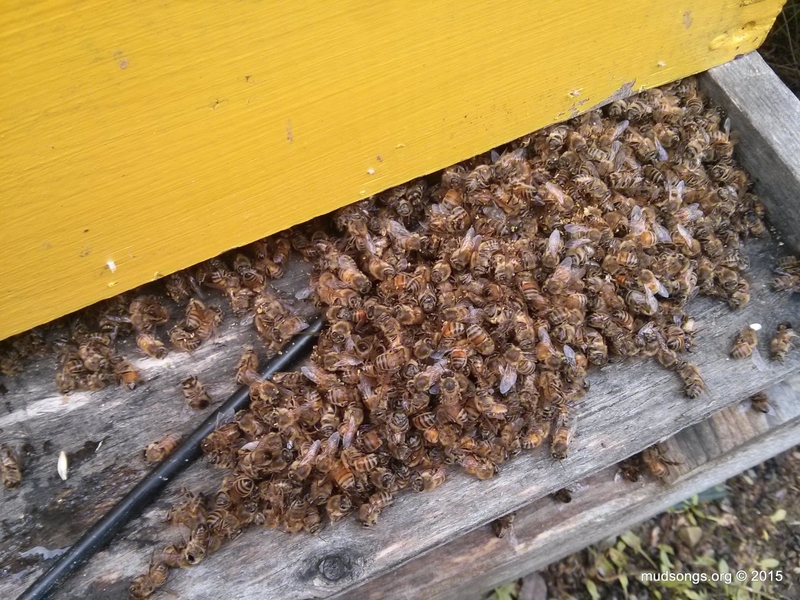 Most beekeepers I know go for the drawing pin method. I have to say UK beekeepers have got it going on. No wrapping of hives? I love it. Drawing pins instead of staples? That’s perfect. Thanks. I’ll try it. As long as shrews and mice can’t pull the drawing pins out, it should work. In the UK we’re all about the simplest, laziest and cheapest options. Mice haven’t learned how to pull the drawing pins out yet… but I wouldn’t like to bet anything when it comes to the shrewdness of shrews. A drawing pin is a thumb tack or push pin. Basically a tack.